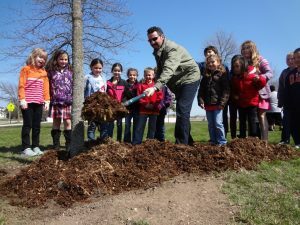 Tree City USA is a program sponsored by the Arbor Day Foundation in partnership with the U.S. Forest Service and the National Association of State Foresters, and implemented by DNR Forestry Division. It focuses on greening communities across the country. The Arbor Day Foundation describes Tree City USA as a great opportunity to celebrate the importance of an urban tree canopy and improve care of these vital city trees. The program gives recognition to communities committed to managing and augmenting their urban tree canopy. The beauty and abundance of trees provides the citizens of Tree City USA communities a general splendor unrivaled by anything else, as well as many other benefits. “Trees bring shade to our homes and beauty to our neighborhoods, along with numerous economic, social and environmental benefits,” states Matt Harris, chief executive of the Arbor Day Foundation. Trees are an asset to a community when properly planted and maintained. They help to improve the visual appeal of a neighborhood, increase property values, reduce home cooling costs, remove air pollutants and provide wildlife habitat, among many other benefits. The League of Wisconsin Municipalities is excited to celebrate Tree City USA’s 40th anniversary, and Wisconsin’s involvement with Tree City USA, by hosting a reception event on October 20th at 4:30, sponsored by the Wisconsin Department of Natural Resources. In addition to appetizers and drinks, entertainment will be provided by students of the Aber Suzuki Center at UW-Stevens Point. The reception will be held in the Northwoods Expo Exhibition Hall at the Stevens Point Holiday Inn Hotel and Convention Center with a program directed by Pat D’Ercole. Speakers will include: Pete Smith, Arbor Day Foundation; Todd Ernster, Stevens Point Forester; Mayor Mike Wiza, Stevens Point.